If you’re an online bingo fan who loves fun just as much as you love big cash prizes, Sun Bingo is definitely the place for you. And there’s never been a better time to sign up for the site than this April- as the site is holding the exciting Slots of Fun promotion. Play absolutely any slot game at Sun Bingo during this promotion and you will receive a 10% bonus back up to a maximum of £20 the very next day. 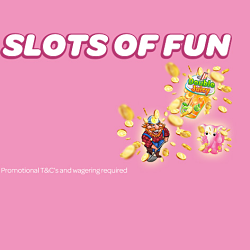 This is something that no slot spinner would want to miss, so keep on reading to find out how to get involved with the Slots of Fun offer at Sun Bingo right now. Sun Bingo has a whole host of excellent slot games from a range of software developers. To play along with Slots of Fun, simply enter the daily bonus code and then deposit and wager real money on any of these great games, such as Dynamite Digger, Double Juicy or Fluffy Favourites. The promotional period lasts from the 1st to the 16th of April. To find the daily code you need to enter, head over to Sun Bingo’s bonus page. All registered members of Sun Bingo are welcome to take part in the Slots of Fun offer. In order to qualify for the 10% bonus back, players need to enter the relevant daily code before playing slot games. There is a 30X wagering requirement attached to the bonuses won in this offer. This can be spent on mini games or slots. The wagering requirement must be met within seven days of the bonus being credited.